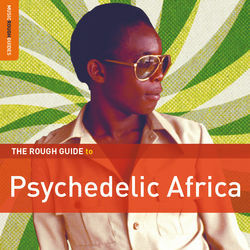 "The Rough Guide to Psychedelic Africa" takes us back to the heyday of soul and funk influenced African psychedelia during the 1960s and 70s when orchestras such as Benin’s Poly-Rythmo, Conakry’s Paillote, Senegal’s Baobab and Tanzania’s Milmani Park were part of the much wider movement of liberty and optimism which resulted in boundary-pushing musical forms, as musicians both connected back to their roots and simultaneously embarked on the journey for a new African expression. "drink in ... this heady brew and taste the flavour of the times"
You can drink in some of this heady brew and taste the flavour of the times through World Music Network’s latest offering “Rough Guide to Psychedelic Africa”. There’s quite a bit of highlife here with offerings from Nigeria’s Sir Victor Uwaifo, the hypnotic, trance-inducing 6/8 rhythm of Celestine Ukwu and the funky James Brown-inspired Victor Olaiya. Ghana’s guitar giant, the transcendent Ebo Taylor slides into afrobeat territory with his nursery rhyme inspired Nga Nga, whilst Senegal's Orchestre Baobab come up with a piece that somehow manages to simultaneously fuse Western Classical music and Spaghetti Western in an unstoppable groove of West African funk. Balla et ses Balladins come with a quietly hypnotic brass-led groove, with a percussion breakdown in the middle, whilst Orchestre Paillotte arrive at a funereal, space-walking pace with the trippy Kadia Blues featuring some almost horizontal trumpet and guitar solos. Milmani Park fuse Highlife, Funk and Soukous, although their track Taxi Driver is reminiscent of Township Jive, with an upbeat groove bubbling throughout and Mali’s Rail Band take us in hand on a 13 minute 27 second tune with a rhythm reminiscent of Cuban cha cha. There is a hard-hitting afrobeat dancefloor-filler from Guinea-Conakry's Orchestra Poly-Rythmo and the album also goes east to check out the jazzier Ethiopian cuts of Alemayehu Eshete. As with most Rough Guide releases it comes with a bonus album specifically looking into the work of one artist from the genre. For this one it’s Sir Victor Uwaifo and his 1971 album entitled “Ekassa”. With each track also called “Ekassa” (followed by a number), some now very dated sounding instruments (check out the organ on "Ekassa 31" - almost John Shuttleworth-esque in it’s swirling cheesiness) and very rudimentary production values, it’s an album that needs a little mind-shift to appreciate the finer points, but it’s a great bit of fun once you get past that. If you’re heavily into the music of 1960s and 70s Africa (especially West Africa) or just curious about why this continent’s output both present and past still dominates large parts of the whole World Music scene this is as good an album as any to start from. The album is released on 12th March 2012 on World Music Network (as is the Rough Guide to Celtic Women).